With over 1.2 billion viewers globally, including millions in the United States, China Central Television (CCTV) reaches the world’s single largest audience. The official mouthpiece of the Chinese Communist Party, CCTV is also a dynamic modern media conglomerate, fully reliant on advertising revenue and aggressively competitive both within China and on the global media scene. Yet this hugely influential media player is all but unknown to the West. Two Billion Eyes tells its story for the first time. For this unprecedented look inside CCTV, noted Chinese media expert Ying Zhu has conducted candid interviews with the network’s leading players, including senior executives, noted investigative journalists, and popular news anchors, as well as directors and producers of some of CCTV’s most successful dramatic and current affairs programs. 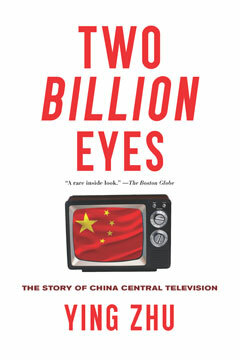 Examining the broader story of CCTV in a changing China over the past quarter century, Two Billion Eyes looks at how commercial priorities and journalistic ethics have competed with the demands of state censorship and how Chinese audiences themselves have grown more critical, even as Party control shows no signs of loosening. A true inside account of one of the world’s most important companies, this is a crucial new book for anyone seeking to understand contemporary China.